Which R-Guard coating is right for me? If you’re looking for a high-performance wall coating to make your building envelope air-tight and water-tight, congratulations, you’re in the right place! But how do you know which coating is right for the specific circumstances of your job? We can help with that. 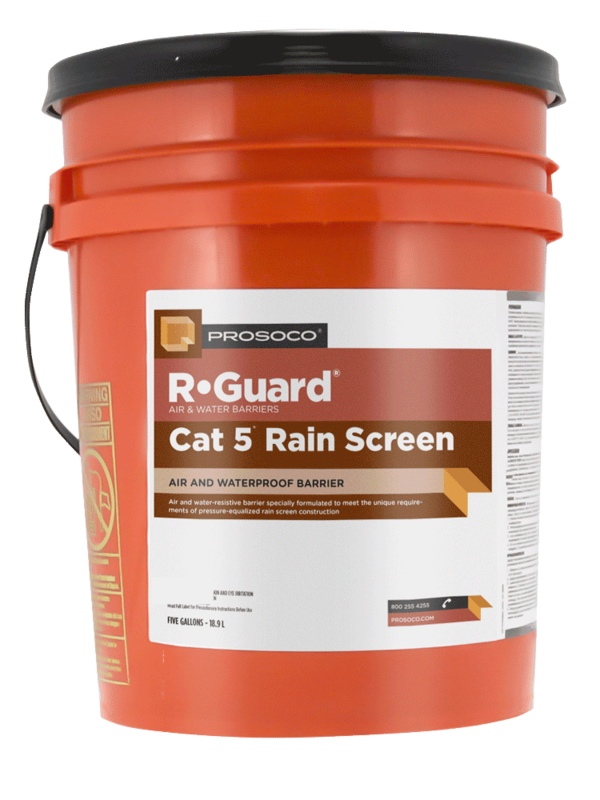 PROSOCO R-Guard fluid-applied air and water barrier systems include products in three general groups: Detailing products, field coatings, and accessories. Detailing products focus on penetrations and transitions, accessories address specific purposes within the building envelope, and field coatings provide a drainage plane for the face of the wall. Coatings are what we’re going to talk about here. Primary field coatings cover the majority of the wall, everything between the penetrations and transitions that are finished with R-Guard detailing products such as FastFlash. The four variations of primary field coatings are: Cat 5, Cat 5 Rain Screen, VB (Vapor Barrier) and Spray Wrap MVP. Each is formulated to fit the needs of specific projects. Which is best for your project? Cat 5 is a single-component, silyl-terminated polymer (STP), and is PROSOCO’s highest-performing and most versatile air and water barrier formulation. Cat 5 is roller-applied and proven to prevent water and air penetration of the building envelope in conditions ranging from everyday weather to the drenching rains and 155+-mph winds of a Category 5 hurricane. Don’t believe us? Watch Cat 5 stand up to 200-mph winds and rain. Cat 5 can also be applied in damp conditions and is immediately waterproof, meaning fewer weather delays during construction. Cat 5 Rain Screen is a roller-applied variation of Cat 5 that’s designed for ventilated rain screen applications. Featuring a darker color and enhanced durability to UV rays, Cat 5 Rain Screen is specifically formulated for use behind open joints where the product may be exposed. Both Cat 5 products are also free of all worst-in-class chemicals found on the International Living Future Institute’s Red List, meaning they are approved for use in Living Building Challenge and other green building projects. VB (Vapor Barrier) is spray- or roller-applied and not only serves as a primary air and water-resistive barrier, but also functions as a vapor barrier. VB is ideal for special construction types that require protection from the passage of air, liquid water and water vapor. 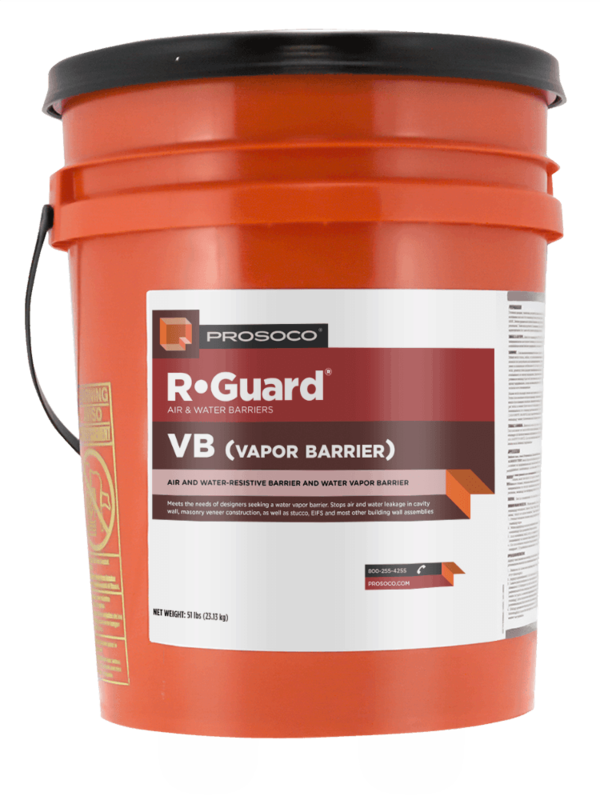 VB is the only R-Guard wall coating that serves as a water vapor barrier. VB is an acrylic-based material and therefore requires dry conditions to apply. Spray Wrap MVP is a spray- or roller-applied, vapor-permeable, water-resistive barrier. It's easy to spray and can reduce installation time and labor costs. Like VB, Spray Wrap MVP is acrylic-based and must be applied in dry conditions. 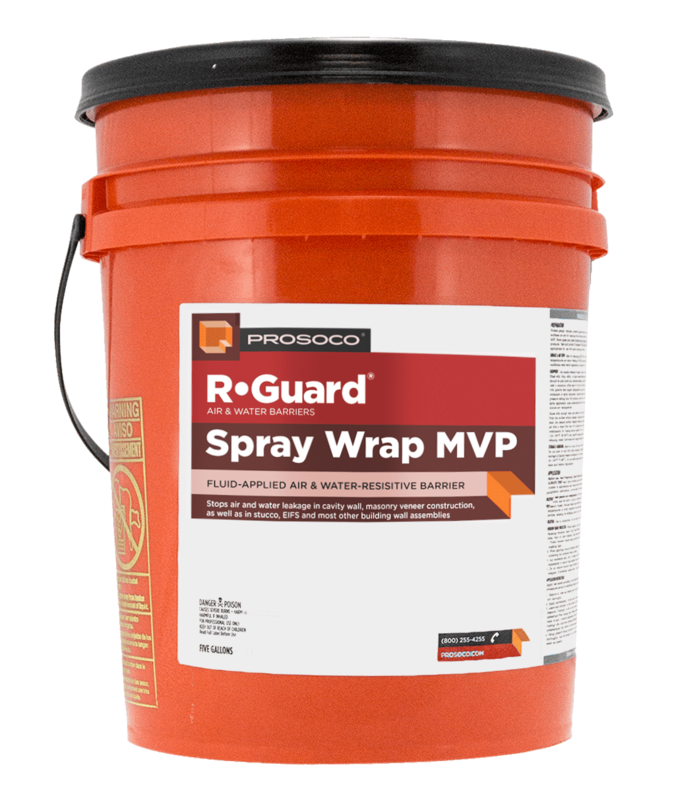 Regardless of the needs of your project, there’s an R-Guard product expertly formulated to give your building an easy-to-apply, high-performing building envelope. Still unsure of what product is right for your project? Give us a call. Subscribe to the Prosoco Newsletter!